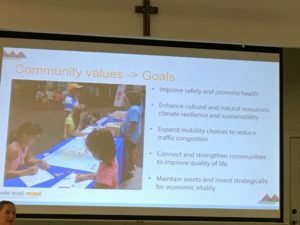 Kihei Community Association President Mike Moran opened the bimonthly KCA member meeting at 6:30 PM Tuesday, March 19 at St. Theresa’s with a reminder of the services provided by the KCA, and the benefits of belonging. He announced a temporary forty percent reduction in the annual membership fee of $25. to $15.! The price change, he explained, was to encourage membership. 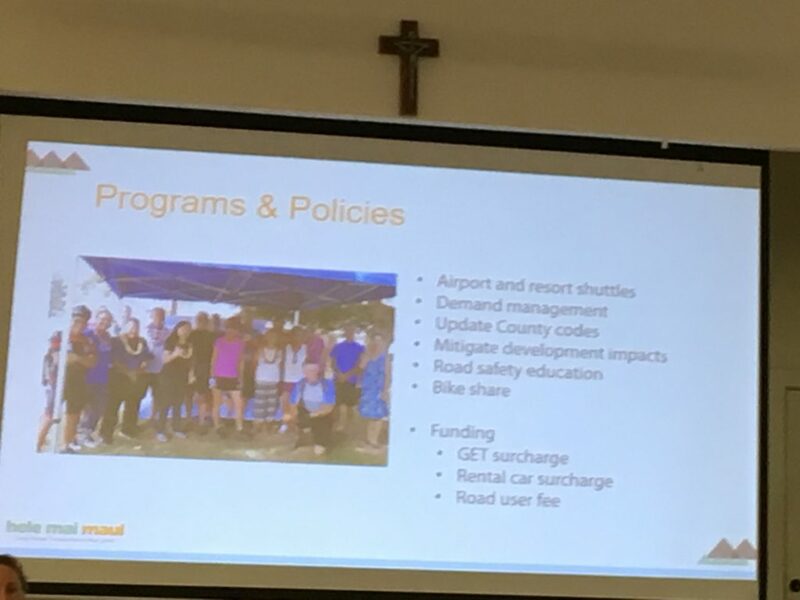 Although he agrees with the statement that Kihei residents can receive the advocacy benefits of the KCA without paying a membership fee, he reminded those present that “Without members, we don’t have an association”. 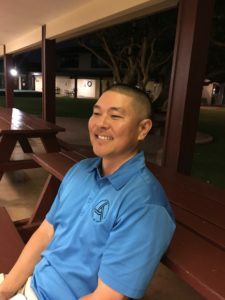 Moran then referred to the recent Land Use Commission meeting which reviewed the progress of the forthcoming high school in Kihei. 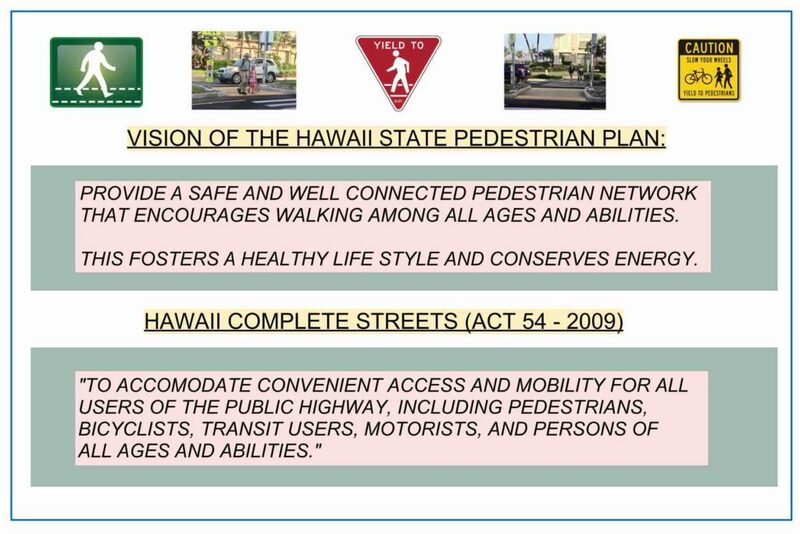 “Five years ago, the DOE lost the original plan,”(Safe Routes To Kihei School Pedestrian Study) he said. They ended up hiring someone else and the result was the Department of Education then said the high school pedestrian access doesn’t require an over or underpass, he reported to the audience. 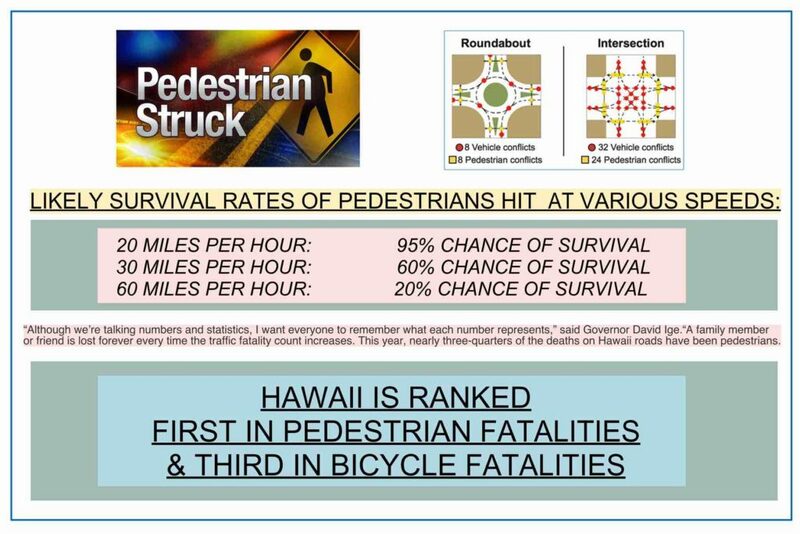 The Kihei Community Association, as well as the Land Use Commission, do not agree with this result. This is an ongoing point of advocacy for the KCA and the Kihei community. 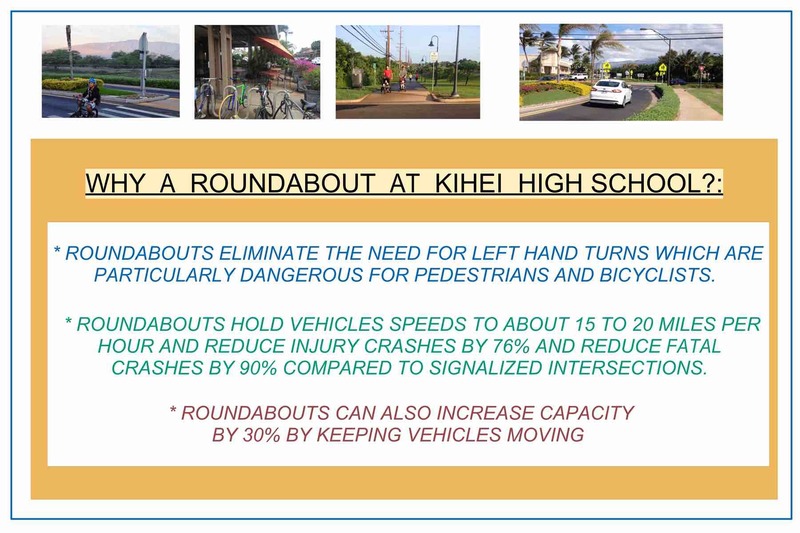 Moran, again reminding the audience of the work of the Kihei Community Association, shared that the roundabout which was established in Kihei on Pi’ikea, near Safeway supermarket was the result of the KCA’s championing. Moran then introduced Lauren Armstrong, Executive Director of the Maui Metropolitan Planning Organization. Armstrong grew up on Maui and earned a master’s in Urban and Regional Planning. 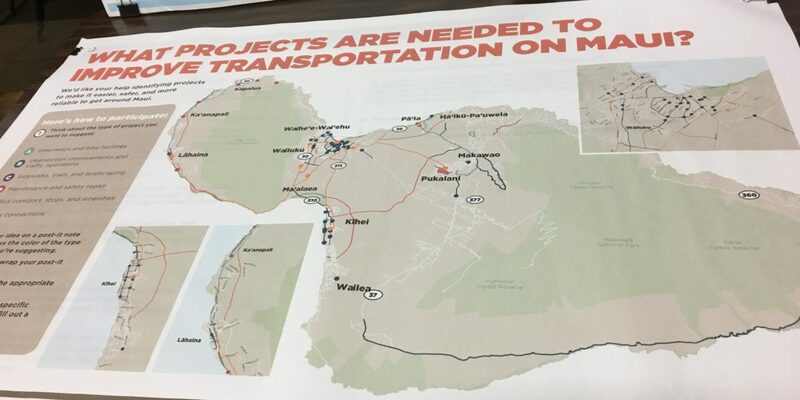 Armstrong introduced the current transportation plan for Maui, named Hele Mai Maui, stating that its goals are to be completed with its projects by 2040. “It’s the vision for the next twenty years,” she said. The goal of the MPO is to come up with a framework based on community values, Armstrong stated. 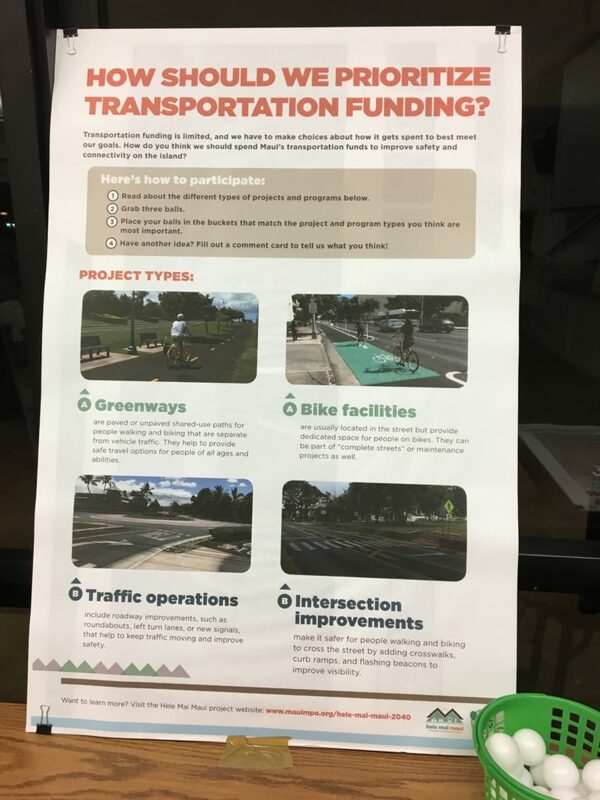 The MPO has been visiting the Town Friday Parties for several months gathering public opinion, among other outreach activities, such as setting up a table at the Queen Kaahumanu Mall. The results of their research are available online. 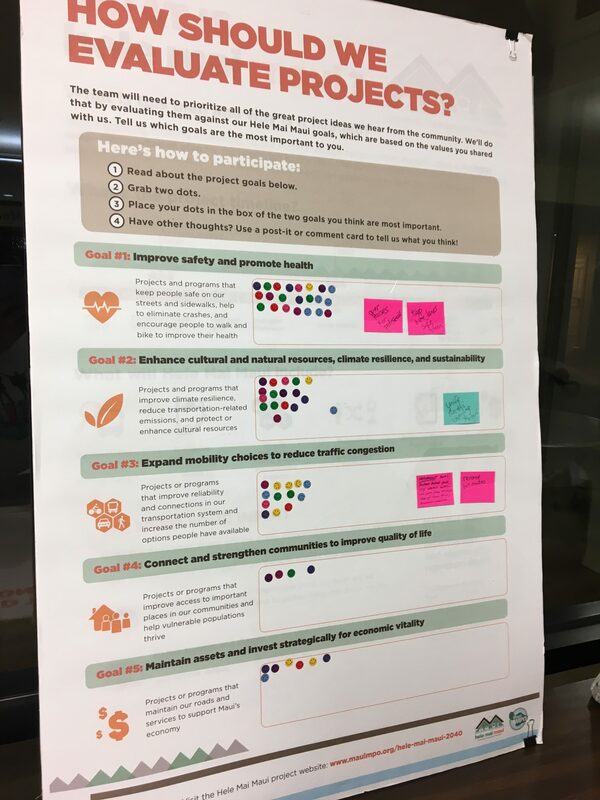 Armstrong invited those present at the meeting to vote for their top three concerns with community planning. 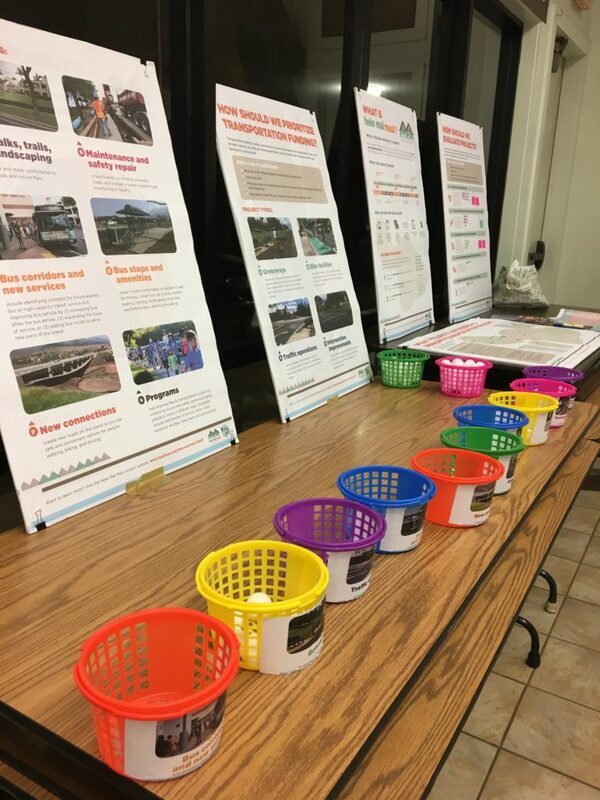 The MPO had set up display boards and a table where interested attendees could place a ping pong ball in the basket labeled with one of several topics of interest when planning: bus stops, greenways, etc. 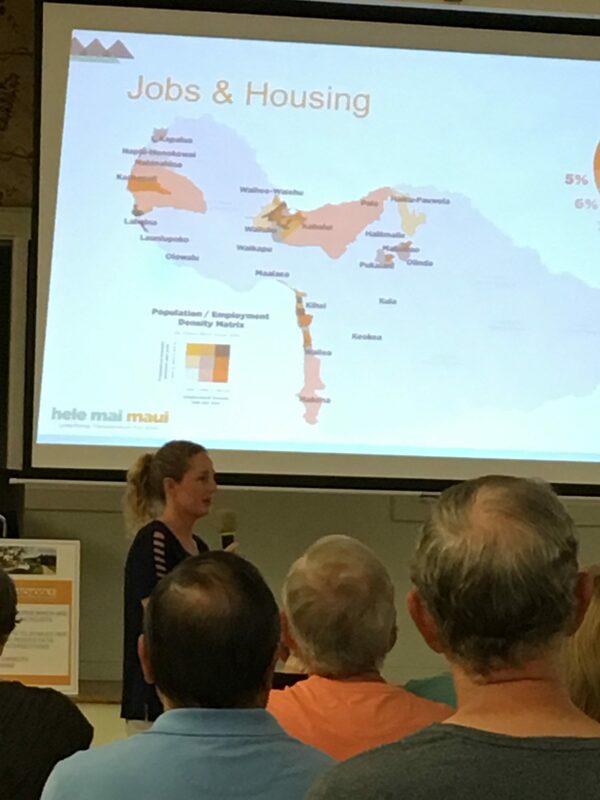 “We need to rethink our planning,” Armstrong stated, referring to the rapid growth and development on Maui. 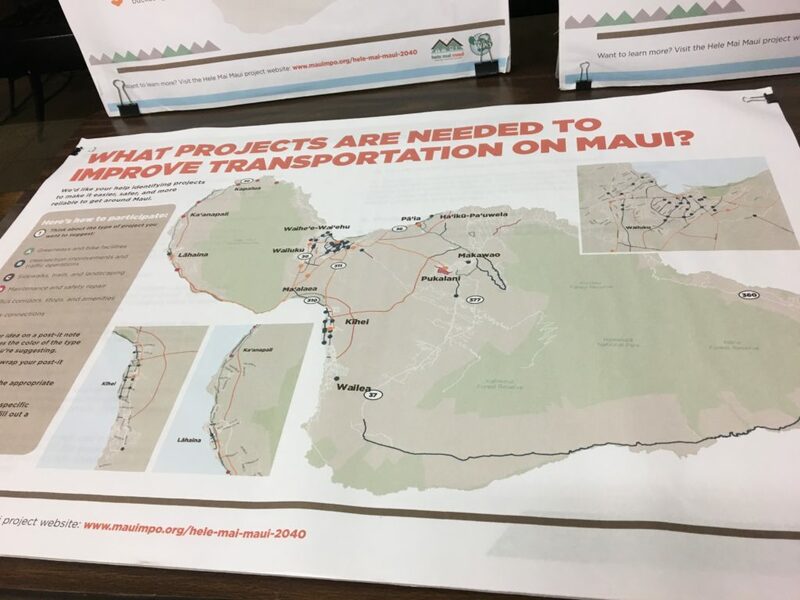 Maui could build more roads, she said, but “more roads would mean more cars,” and the environmental effects of those cars will follow. 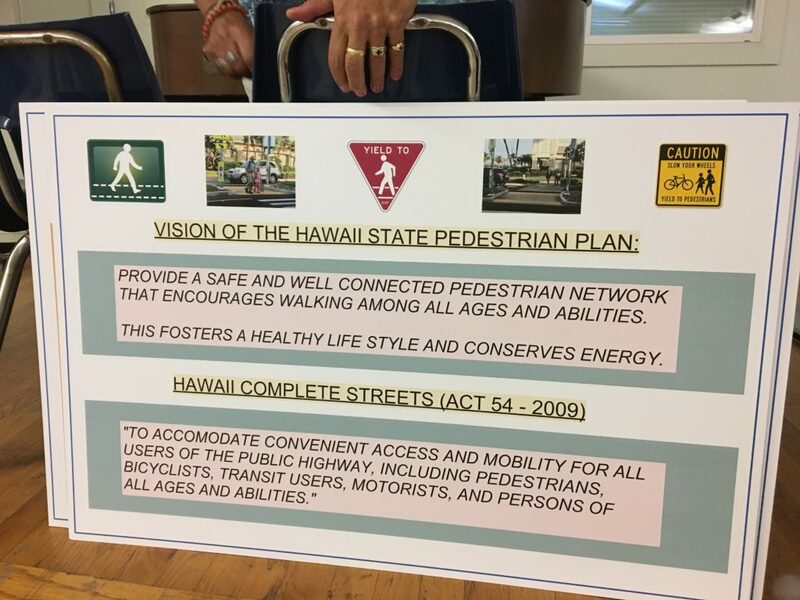 “We need more options for getting around.” She listed biking, walking, using the bus, as some of those options, and stated that having those options are key for Maui’s next twenty years of transportation. 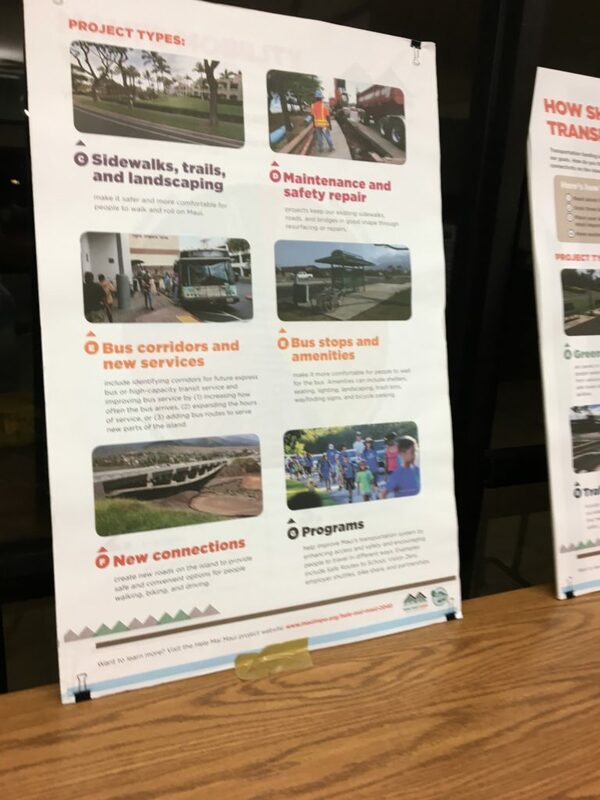 As far as funding for these projects, Armstrong referred to a proposed ½ percent GET surcharge, to be specifically be used for transportation projects. She noted that Kauai had adopted a similar surcharge to successfully raise funds for their own transportation needs. 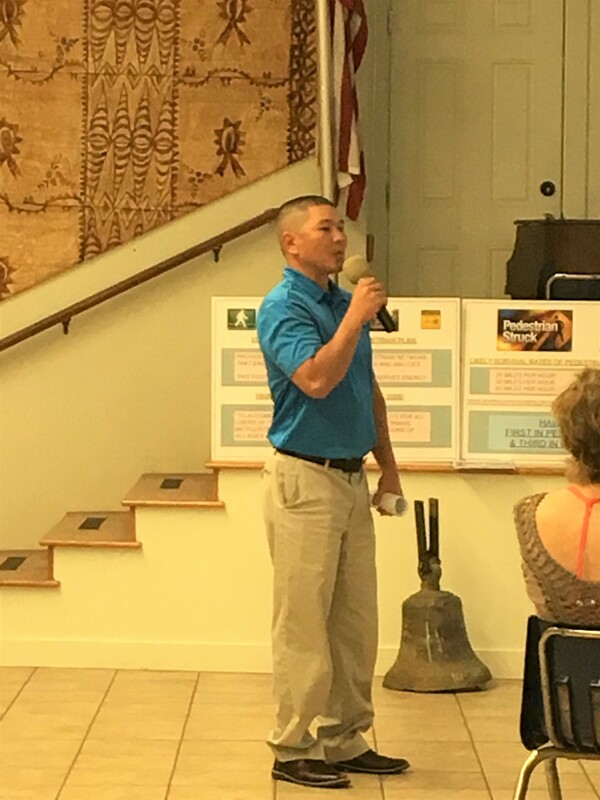 Robin K. Shishido, the district engineer for the Department of Transportation, spoke about a pilot program for a road user fee, which would replace the current gas tax. The road user fee is still under discussion. Additionally, in a response to Moran’s earlier comments about the pedestrian access issue and road safety for the future high school in Kihei, Shishido remarked that “Roundabouts are a viable option (for Kihei)” in support of pedestrian and traffic safety for the new high school. 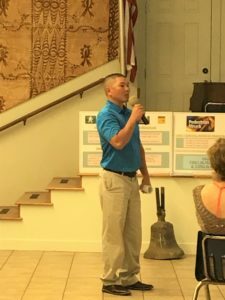 The meeting then transitioned to a fire safety presentation by the Fire Department’s public education representative, Nohea Williams, an eleven year veteran of the fire department. His co-leader was Captain Paul Haake. Both men are from station number six, Kihei Fire Station, on Waimahaihai Road. Williams noted that the five major causes of household fires are candles, smoking, cooking, heating, and misuse of electrical items, such as extension cords. “Extension cords are temporary wiring, not permanent wiring,” he stated, referring to a practice where some people use extension cords as a long term solution for their needs. He said that fire extinguishers should be every 75 feet within a home and smoke alarms should be replaced every ten years. 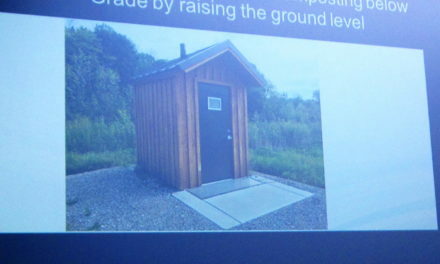 Both Williams and Haake spoke about the need for fire prevention, escape routes, with a meeting place for family members as part of the plan. Haake especially emphasized that having a meeting place will help the fire department know if everyone has exited the house. If not, then the firefighters will know that a rescue operation must take priority. There were instructions on how to operate a fire extinguisher. There was advice that if you find yourself trapped on a second-floor building, with no way to exit the room through the door, then go to a window and make a lot of noise to get the attention of the fire department. 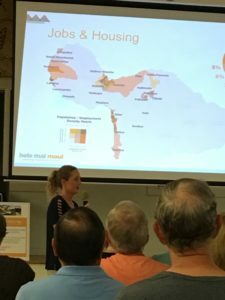 The question and answer session which followed the presentation included a question from a Wailea resident and Kihei Community Association member who preferred to remain unnamed. She identified herself as having survived the recent Wailea fire. It had been reported to her that the three-mile-long fire which quickly consumed 200 acres around Wailea was started by rodent activity. 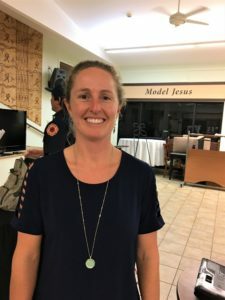 She asked who would be responsible for clearing the brush that exists by the freeway and the other places surrounding the South Maui area which went up in a horrific blaze January 2019. If there were any further questions, Haake said MECO would appreciate the phone call from any citizen who wanted to share their concerns. Haake’s conversation echoed the recent announcement of Fire Chief David C. Thyne, who had stated in a February 20 letter that fire mitigation was the shared responsibility of “fire department, landowners of undeveloped land and MECO”. 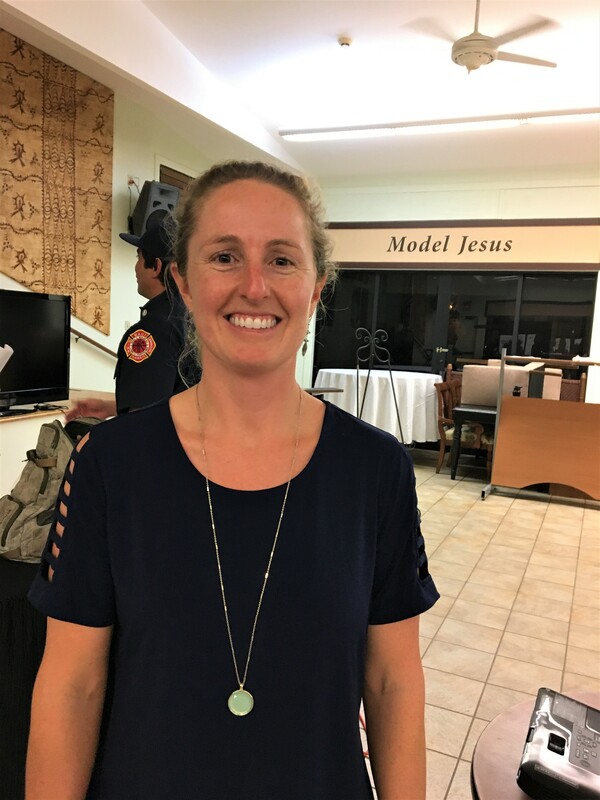 The letter was a response to queries made by the KCA of the Maui Fire Department and of the Maui Electric Company for the results of the investigation of the Wailea fire and their plans for actionable tasks for fire prevention within the Maui community. The Thyne letter outlines specifics such as landowners being held responsible for the implementation and maintenance of fire department recommendations and MECO holding themselves accountable for any prevention measures to ward against a fire being caused by their operations. Meetings of the Kihei Community Association are held the third Tuesday of every other month from January to November. Meetings usually run from 6:30 PM to 8:00 PM. There is no meeting in December. 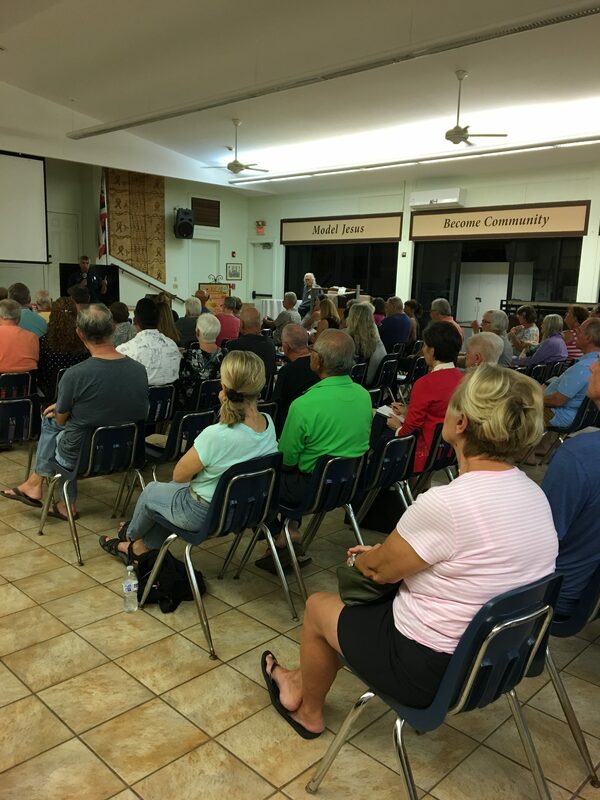 The next meeting for the Kihei Community Association is scheduled for May 21, 2019, with the location to be announced later. NextExpect WORSE traffic in North kihei starting Monday!